This study covers mainly the cultural encounters between Europe and the Ottomans who had become immediate neighbours on the Balkans and the Mediterranean after the Ottoman state expanded into Central Europe. The two cultures met in different geographies under different conditions and through the centuries the rulers and art patrons as much as the political, diplomatic and trade relations had a great role in the cultural exchange. Different as the two artistic traditions may seem, cultural contacts enriched each other's artistic and technical achievements, little affected by wars and conflicts of belief. Sultan Mehmed II is considered as one of the rare rulers who changed the course of world history but less well-known is his art patronage that left deep traces in the Western and Eastern world. 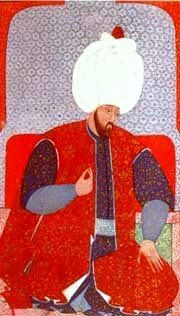 Mehmed II, who was interested in ancient history and Western culture from an early age, was the first Ottoman ruler who had cultural relations with the West. He enriched his library with a great number of scientific books written in various languages in the fields of geography, medicine, history and philosophy. Among these were Bibles and classical Greek works. Giorgios Amirutzes of Trabezond produced a world map for the sultan by making use of Ptolemy's Geographike. In the Topkapi Palace, there is a Latin copy of the Geographike and an Italian translation by Berlinghieri Fiorentino dedicated to Mehmed II. Mehmed II's personality, politics and his interest in the Western world led to the spread of the image of the Turks in European art. The first portrait of the sultan produced in Europe has the inscription El Turco and it is based on the image of the Byzantine Emperor Johannes Paleologus found on a medal struck on the occasion of the council that convened in Florence in 1438 with the purpose of uniting Eastern and Western churches. Mehmed II, who followed developments in Renaissance art and science, wanted to immortalize his own image with medals and portraits, like the Greek and Roman rulers and the Renaissance humanists whose portraits were objects of diplomatic and cultural exchange. He requested artists from several rulers in Italy. Sent by Ferdinand Ferrante II, the King of Naples, Costanzo da Ferrara, was the first Italian artist who came to the Ottoman palace. This Venetian medallist stayed in Istanbul in the mid-1470s and struck medals with portraits of the Conqueror. After the peace agreement made with Venice, in 1479, political and cultural exchanges with the Venetians had increased. The Sultan asked the Doge of Venice for a bronze caster who could make medals and a painter. Gentile Bellini came and worked for the Sultan in Istanbul, struck a medal with the Sultan's portrait and produced other portraits and city views. Moreover, it is thought that the Sultan sent this medal to Lorenzo dei Medici with whom he had good relations. Mehmed II had arrested in Istanbul the leader of the Pazzi uprising against the Medicis. Bellini's most important work is the oil portrait that is now at the National Gallery in London. In this portrait, Bellini used the Renaissance portrait model but still followed an oriental iconography. According to recent research, the crowns on both sides of the arch in the portrait symbolize the Ottoman Sultans preceding Mehmed II. The seventh crown that of the reigning Sultan Mehmed is found on the embroidered cover. The important point is that Mehmed II obtained what he wanted and the portrait medals he commissioned and their copies made in Europe ensured the spread of the image of the Sultan in Europe. The activities of the European masters undoubtedly influenced the local artists working at the Conqueror's ateliers. A portrait of the Sultan attributed to a local artist, Sinan Bey, shows how borrowings from Western painting were transformed into Islamic norms. Bellini as well as many other fifteenth and sixteenth century painters, led by the Venetian painters, used figures dressed in Turkish costumes in their paintings depicting scenes from the Bible. It is known that in this period the Ottoman fabrics and carpets were imported to Italy by Italian merchants. Moreover, fabrics similar to these were produced in some of the Italian cities. Turkish carpets depicted in fifteenth century European paintings are proof of their popularity. A look at the European-Ottoman relations throughout the centuries clearly indicates that the cultural relations stayed firmly behind political and economic developments. Among the Islamic communities, the Turks have always had the closest relations with the Western Christian world. The way these relations were reflected in art and culture since the fifteenth century shows variations according to political alliances, victories and defeats, diplomatic relations, and even the personalities of the art patrons. While in the earlier years the Turkish image in Europe carried an exoticism brought by the unknown, for the Europeans in the sixteenth century, the Ottoman Empire was a state administered by powerful rulers, having great political significance for Europe. 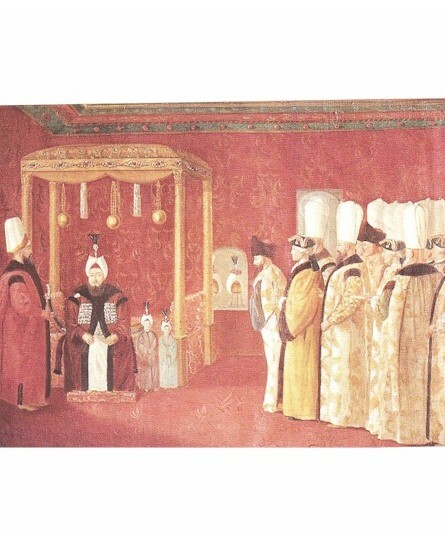 In this connection, the powerful rulers of this empire, the pompous ceremonies of the Ottoman court and the elaborate Ottoman costumes were reflected in European art. No doubt, the unique topography and interesting monuments of Istanbul, the capital city of the empire, were drawn by almost every artist. However, during these centuries the European-Ottoman cultural relations preserved their unilateral character. More accurately, a profound European influence was not encountered in the Ottoman culture and art until the eighteenth century. However, after the eighteenth century, both the Ottomans and the Europeans attempted to become more closely acquainted with each other under equal terms and have been even more inspired from each other. The European influence penetrating into Turkish art in parallel with the Turquerie fashion developing in Europe is a concrete indicator of these relations. The political balances in the nineteenth century pushed the Ottomans into an intensive westernization and the European culture was much more influential. It is a fact that Ottoman-European cultural interactions developing throughout history have contributed a rich content to both European and Ottoman art and indicates that different cultures can create powerful syntheses. Figure (front). Portrait of Mehmed II painted by Gentile Bellini, London National Gallery. Figure (top). Portrait of Sultan Süleyman painted by painter Osman, 1579, Kiyafat al-insaniya fî shemâil al-Osmaniya, Topkapi Palace Museum H 1563. Figure (bottom). Swedish ambassador Ulric Celsing received by Sultan Mustafa III, anonymous, Celsing Manor, Bibi, Sweden.